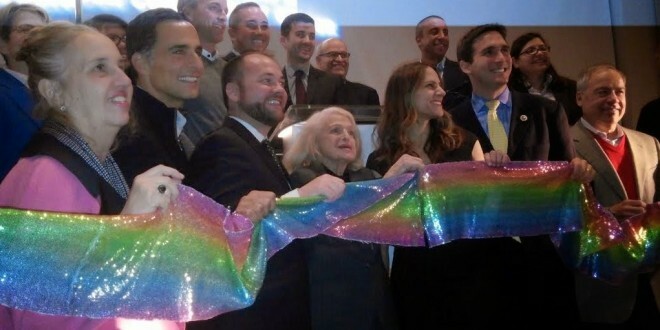 New York City LGBT Center Celebrates With Ribbon-Cutting After $9.2M Remodel - Joe.My.God. Last night I attended the ribbon-cutting ceremony at the New York City LGBT Center, which is almost finished with a 14-month $9.2M remodeling that has dramatically reshaped the building, an 1844 structure that in 1938 became Food Trades Vocational High School. Leading the ceremony was Center executive director Glennda Testone and Edith Windsor, who announced that the Center will be the recipient of her personal papers. Speakers included Manhattan borough president Gale Brewer, City Councilman Corey Johnson, state Sen. Brad Hoylman, state Assemblywoman Deborah Glick, NYC Comptroller Scott Stringer, and a representative from Mayor De Blasio’s office, who declared yesterday to be LGBT Center Day in New York City. The Center hosts hundreds of groups and was the birthplace of ACT UP. The ribbon was provided by rainbow flag creator Gilbert Baker. UPDATE: JMG reader Glenn provides us with his video of Edith Windsor’s speech. Lots of gay history here.